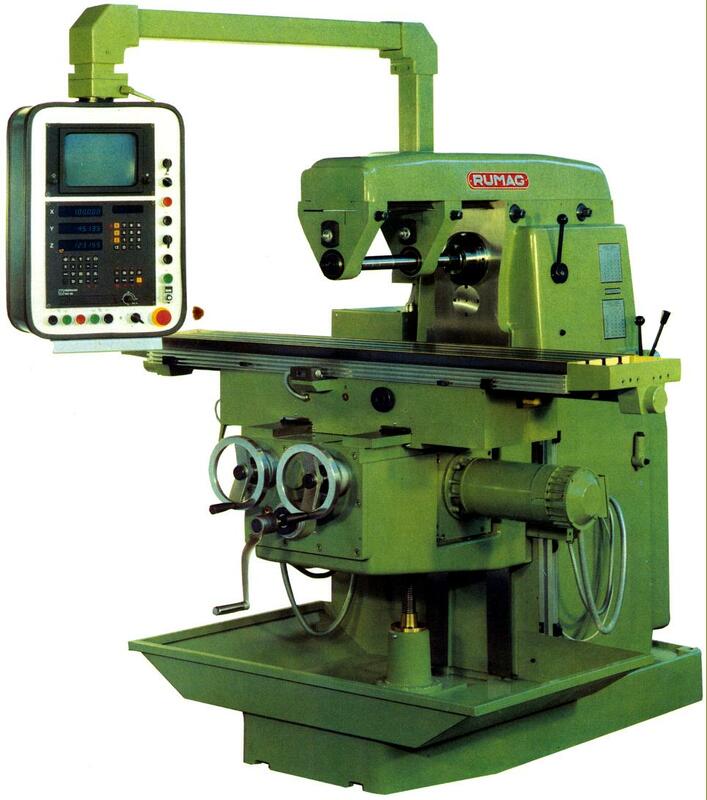 Using the same base, column, knee, table, cross support, overarm and other larger components, the Series 2 miller was built in a wider variety of styles and with a greater choice of specification than the others in the maker's range. 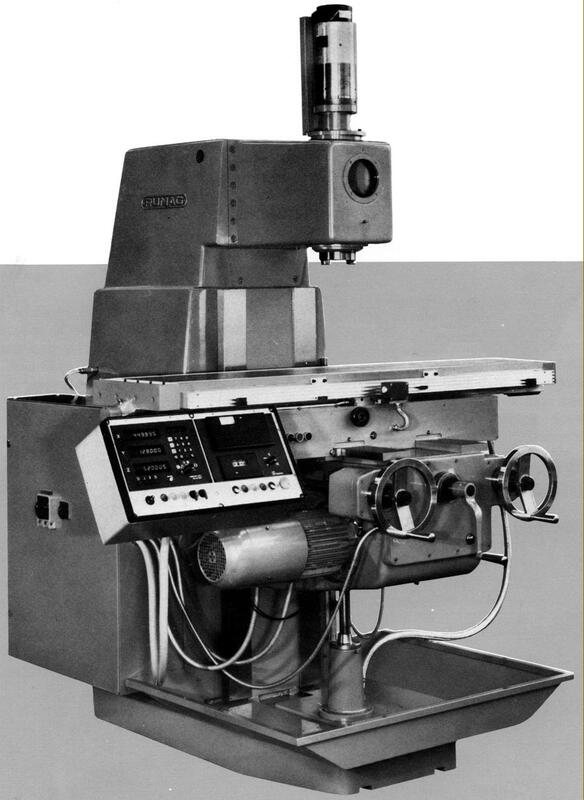 The main version offered were plain horizontal, universal with swing table, vertical and as a horizontal fitted with an internal gearbox ram-type vertical head with a double-swivel end that had 100 mm of fine-feed quill travel. Driven by a motor contained within the main column, the horizontal models (Types RU and RE) had a stiffly supported main spindle, made from hardened and ground steel, running in selected, high-precision double-row bearings and driven by multiple V-belts on the higher speeds and through gears on the lower. 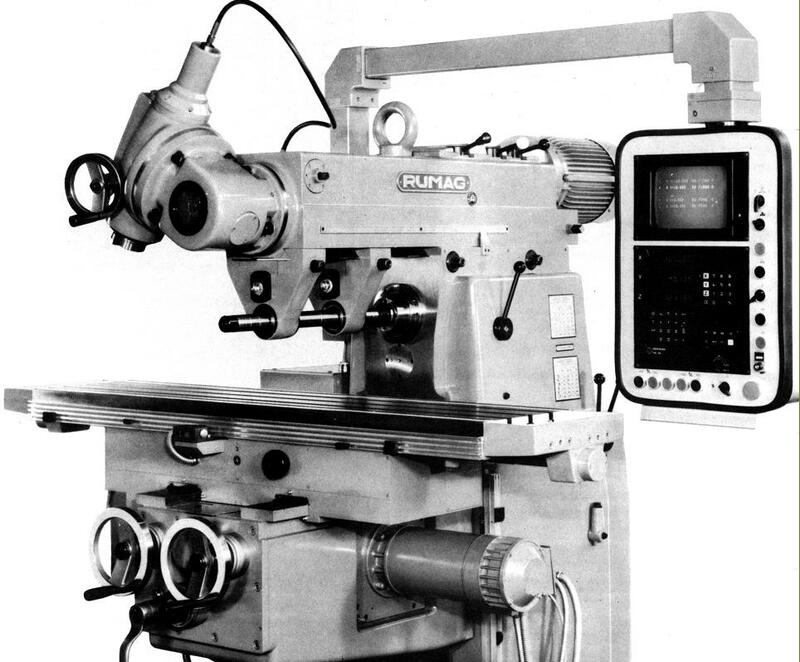 The pure vertical models (REV) used the same spindle drive but with the motion turned through 90° by fine-lapped, spiral-toothed Klingeinberg-Palloid bevel gears. Clamped to the column face by four bolts, the head could be rotated through 360° and had a quill with 100 mm of travel operated by a full-circle handwheel that gave a fine feed. Motor power varied according to machine type with the smallest models, the RE-2-G and RU-2-G and Rumavertical RE-2-VS and RU-2-VS, having as standard 4 or 5.5 kW; all other types were also offered with a choice - 5.5 or 7.5 kW - although the vertical machines, the REV-2, REV-20 and REV-25, were usually supplied with the more powerful option. Motors were available as single or 2-speed types of which two of the former and one of the latter were listed: for all the ordinary horizontal and vertical types with a 1400 r.p.m. 1-speed unit the twelve spindle speeds ranged from 25 to 1050 r.p.m. ; the 2800 r.p.m. version gave 100 to 2100 r.p.m. and with the 2-speed 1400/2800 r.p.m. type a very useful twenty-four speeds from 25 to 2100 r.p.m. 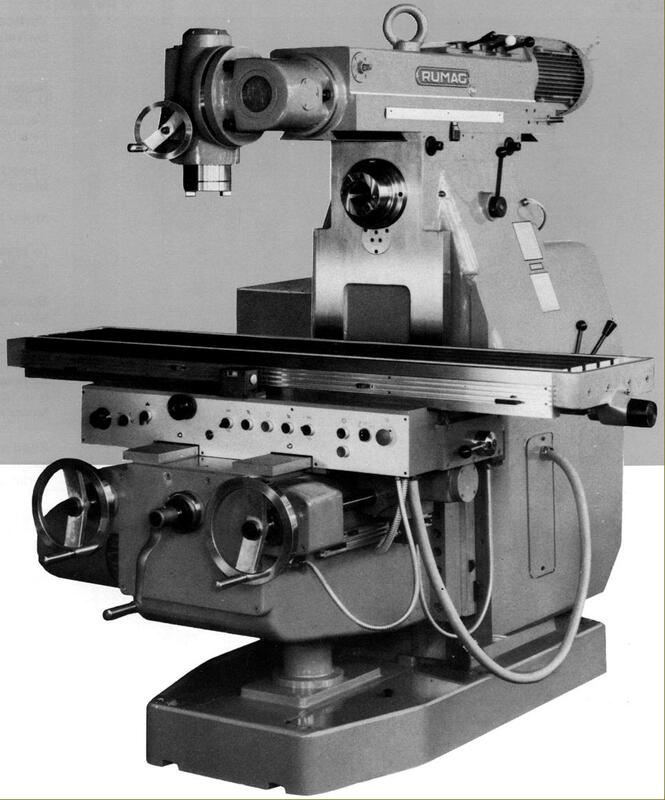 The geared ram head on the Rumavertical was offered with various motors: a 1400 r.p.m. of 4 or 5.5 kW on the RE-2-VS gave ten speeds from 56 to 2800 r.pm. and a 2-speed 1400/2800 version twenty speeds from 28 to 2800 r.p.m. The two larger versions could be fitted with either a 5.5 or 7.5 kW single-speed 1400 r.p.m. type or a 2-speed 1400/2800 r.p.m. version - the resulting spindle speeds being identical to the smaller model. All splines, gears and shafts (the latter supported in either ball roller bearings) were made from hardened and ground steel of the highest quality with lubrication by oil bath. Each size of miller was offered with a choice of tables: the RE-2 in horizontal, universal and Rumaversal forms could be had with either a 1000 x 330 mm and all other versions with a choice of 1250 x 330 mm, 1450 x 330 mm, 1300 x 400 mm and 1500 x 400 mm. Travels varied from 700 mm longitudinally on the 1000 mm table to 900 mm on the 1250 mm version and 1100 mm on the 1450 and 1500 mm lengths. While the RE-2-G and RE-2-VS were limited to 280 mm of cross movement the RE-20-G, RE-20-VS and RE-25-VS had 350 mm. Vertical movements were 480 mm on all the vertical REV types, 500 mm on the RE-2-G and RU-2-G and 530 mm on the larger RE-20-VS and RU-20-VS models. While the smaller types had conventional speed-change table-feed gearboxes (that gave a range of twelve rates from 15 to 750 mm/min. horizontally and across directions and from 7.5 to 375 mm/min. vertically) feeds on all the Type 25 versions were driven by a variable-speed, externally mounted DC motor that gave longitudinal and cross rates from 20 to 2000 mm/min and vertical set more sensibly at 10 to 1000 mm/min. Rapids on all types were at 2000 mm/min laterally and 1000 mm vertically. Control of feed rate was by a dial, with selection of direction by push-buttons and disengagement by either hand or adjustable trip dogs. As a safety measure the table and knee handwheels were arranged to disengage automatically when power feeds were running. By the early 1970s Rumag were offering the Series 2, in all its forms, with NC control, their preference being for installations by Heidenhain. 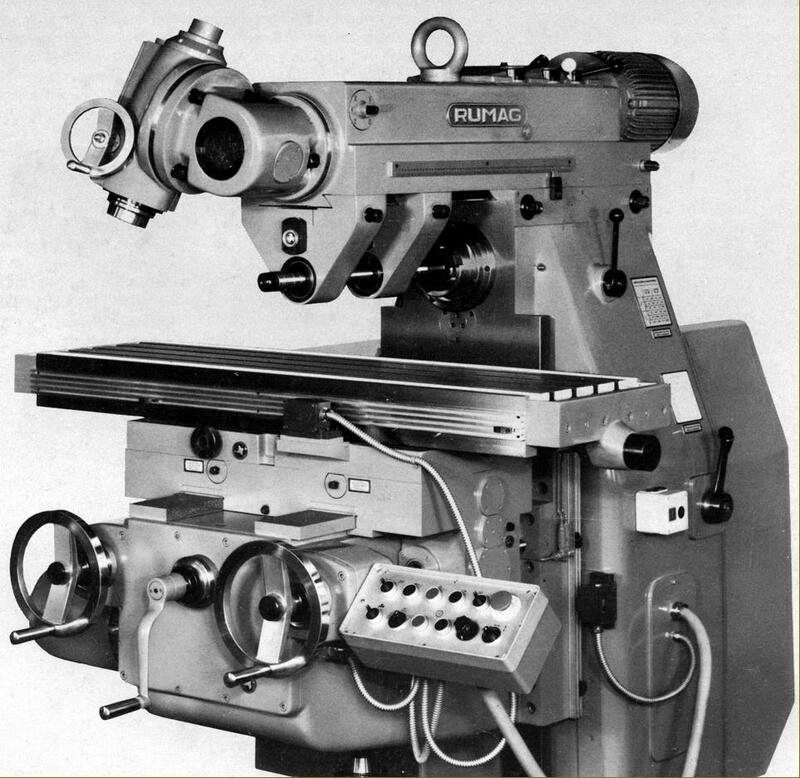 For example the RU-20-VS- 2-A would have been a Series 2 horizontal "Heavy" model fitted with a ram-type vertical milling attachment able to swivelled in two directions from central and with power in-and-out feed..
Largest of the Rumag machines, the Series 3 was, like the Series 1 and 2, based on a single model adapted to a variety of specifications as the Plain Horizontal RE-30, the Universal swing table (45° in each direction from central) RU-30, Vertical RV-30 and the Rumaversal, a combined Horizontal/Vertical/Ram Head sold as the RE-30-VS with a fixed table and the similar RU-30-VS with a swivel table. 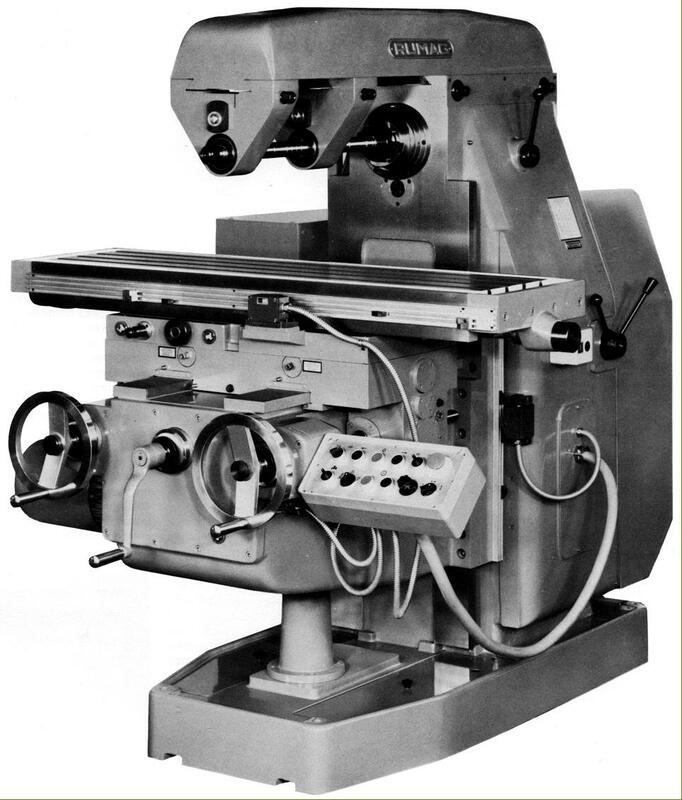 Of massive construction and considerable weight - around 4000 kg - the miller had modern, clean lines and could be adapted, in all its forms, to CNC control, the maker's preference being for installations by Heidenhain. The main castings were all heavily built and internally ribbed, the base plate having especially strong ones in a W-section. Slideways were especially wide - 420 mm on the vertical knee ways and 430 mm on the cross - and the table longitudinal ways fitted as standard with forced lubrication (a fitting that could be provided at extra cost to the other slides). 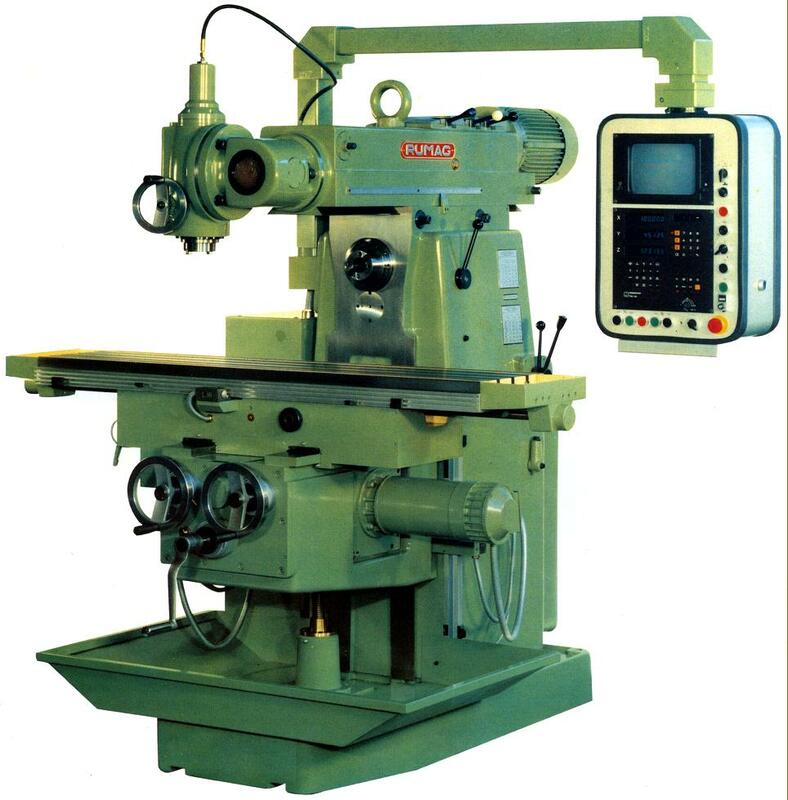 Adjustable double bronze nuts were fitted to the cross feed and an anti-backlash device to the longitudinal, the latter device intended to allow cuts to be made in the same direction as the rotating cutter (climb milling) when using an auto cycle feed or under CNC control. 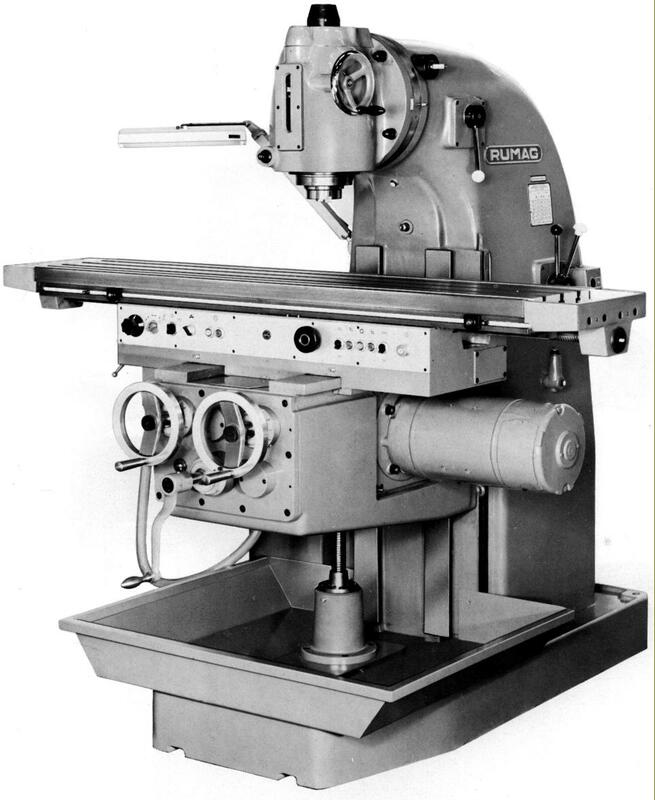 Like contemporary Parkson machines, Rumag specified a (3 kW) DC variable-speed drive to the table feeds and omitted handwheels at the table ends, these being provided, together with electrical switches to select feed direction, at the front of the machine. Feeds were engaged through push-button controlled electromagnetic clutches - a wonderful system until they fail and it's discovered that the maker has gone out of business. Feed rates could be varied between 10 to 1000 mm/min on all models with rapids set at the single rate of 2000 mm longitudinally and across and at 1000 mm/min vertically. Although tables were available in just one width - 450 mm - three choices of length were available: 1250, 1600 and 1800 mm. Each had four 16 mm T-slots on 75 mm spacing and travels of, respectively: 900, 1250 and 1450 mm. Cross travel was 400 mm on every models and vertical 525 mm on all but the RV-30 vertical - where the depth of the head caused it to be reduced to 500 mm. Both horizontal and vertical spindles were fitted with an ISA 50 nose, though that on the ram vertical head having a choice of an ISA 30 or 40. Drive came from either an 11 or 15 kW motor mounted inside the main column with drive to the hardened and ground spindle on the higher speeds directly by multiple V-belts. 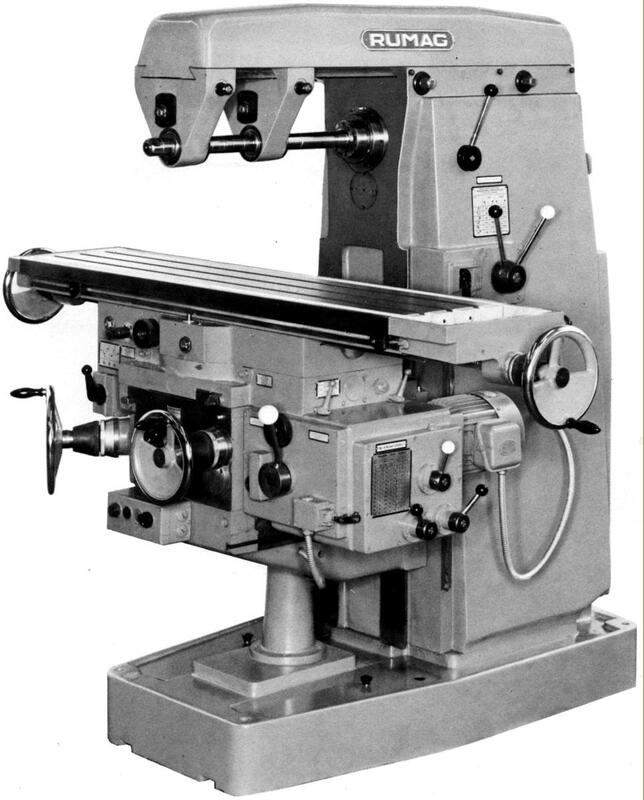 Lower speeds were sent though a 8:1 splash-lubricated lathe-like backgear system, the final gear of which was carried on the spindle immediately behind the front double-row selected high-precision roller bearings (its weight being designed to add to the flywheel effect of the drive). With a single-speed motor running at 1400 r.p.m. twelve speeds were provided that ranged from 31 to 1000 r.p.m. (or twice as fast with the 2800 r.p.m. option). Also available, though on the vertical model only, was a two 2-speed 1400/1800 r.p.m. motor that gave 22 speeds from 31 to 2000 r.p.m. 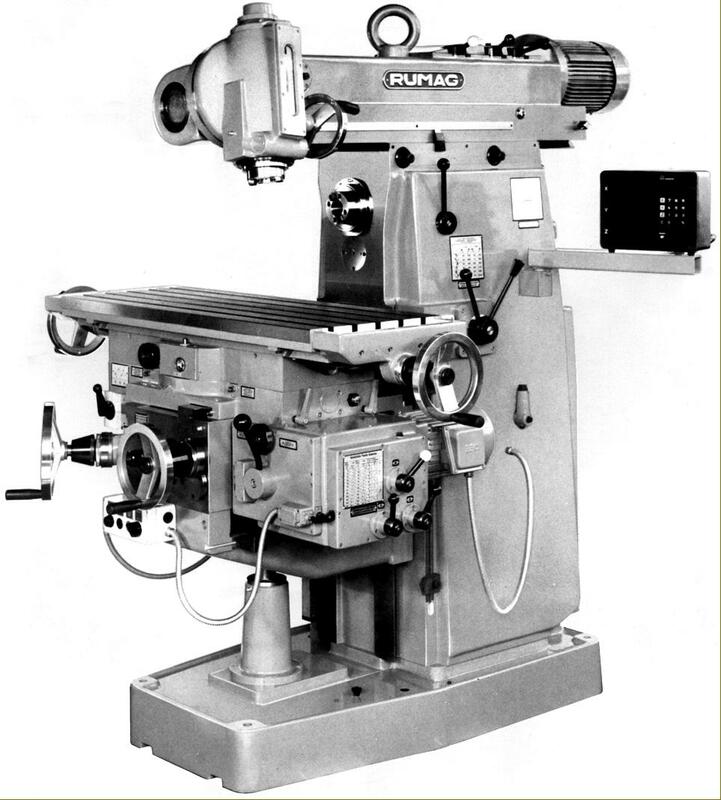 The twelve horizontal spindle speeds RE-30-VS and RU-30-VS were slightly different - running from 56 to 2800 r.p.m. - with the vertical ram head having its own 2-speed motor producing twelve speeds from 28 to 2800 r.p.m..